You might have seen ads for new “5G Evolution” networks from AT&T, and the other carriers are bound to follow suit. News flash! That’s not 5G and you’re falling for an advertising gimmick. But 5G is coming soon, nonetheless. 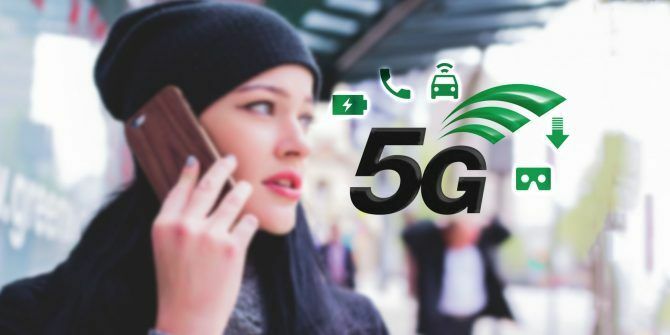 Some carriers have jumped the gun, claiming they already offer 5G. This is a blatant lie. It’s actually only a faster and better version of current 4G LTE technologies. The advertising lies got so bad that the U.N. had to step in. For every “G”, the mobile world (manufacturers, carriers, tower operators, etc.) have to agree on a set of specifications. The agency that defines these standards is the International Telecommunications Union (ITU), a United Nations body. And it finally came out with a set of specifications recently, that prove the “5G” claims of carriers are bogus. AT&T’s “5G Evolution” does not meet these specifications, and neither will Verizon’s upcoming claim of delivering 5G. They are using 4G technologies like 4×4 MIMO (what is MIMO? 4 Things to Know Before Buying a Wi-Fi Router for Your Home 4 Things to Know Before Buying a Wi-Fi Router for Your Home Wondering how to get Wi-Fi at home, what a Wi-Fi router is, or what kind of router you need? This introduction will answer your questions and more. Read More ) to boost data speeds, but they don’t match 5G. And while data speeds are important, 5G isn’t just about data speeds. There’s so much more to it. Right now, 5G isn’t defined 5G is Coming in 2017, Will Be Faster Than Google Fiber 5G is Coming in 2017, Will Be Faster Than Google Fiber Verizon is about to change the wireless industry in a big way as it begins field testing 5G wireless technology within the next 12 months. Read More . No one knows the final specifications yet. But the ITU has so far agreed on a few key requirements for 5G performance. No Call Drops — This is the biggest change for the regular mobile user. You will not drop calls or lose internet connectivity when you’re switching between towers on a 5G network. The ITU says a 5G network is one where such mobile interruption time does not exist, so unless that specification is met, it’s not 5G. Low Latency — 5G phones will have latency between 4ms and 1ms (the lower the better). Latency, measured in milliseconds, is the amount of time that your phone takes to send a signal to an internet server. The fastest for 4G is a latency of 50ms. Low latency will drastically improve experiences like augmented reality, or virtual reality with smart glasses. Battery Efficient — You’ve heard about how data connectivity is draining your phone’s battery. The 5G networks will significantly reduce that with better “sleep” features. “Sleep” is when the phone isn’t using the network. Works at 500 Km/h — The faster your vehicle is driving, the faster your phone is moving. This means your phone is changing mobile towers at a rapid rate. Current mobile networks can’t handle these rapid handovers between towers. 5G will work even when you are in a high-speed train travelling at 500 Km/h. 5G networks will have a real-world download rate of 100 Mb/s (Megabits per second) and upload rate of 50 Mb/s. That’s about 12 MB of data download per second. An hour-long Netflix show in HD will download in roughly four minutes. The ITU distinguishes between “peak data rates” (technically highest possible in lab settings) and “experienced data rates” (what users will get in real-world conditions). 5G will have peak data rates of 20 Gb/s (gigabits per second) downlink and 10 Gb/s uplink. In lab tests so far, Nokia and Samsung have managed downlink speeds of 10 Gb/s and 7.5 Gb/s, respectively. When Will 5G Phones and Networks Be Available? The estimate for regular consumers to get 5G phones is 2020. The U.S. will see the first lot of 5G-compliant devices in 2019, according to Intel and Ericsson executives. But the ITU’s timeline puts 2018–2020 as a period of “defining the technology,” so there might be some changes left. That 2020 estimate is partly based on the mobile world’s 10-year cycle of launching the next generation network EDGE, 3G, H+, Etc: What Are All These Mobile Networks? EDGE, 3G, H+, Etc: What Are All These Mobile Networks? Are you on the fastest mobile network? If not, where do you fall on the spectrum? These mobile network symbols can be confusing, but don't worry because we'll clear it up for you. Read More . It started with analog 1G in 1982, moved to digital 2G in 1991, boosted to 3G in the 2000s, and landed on the current 4G networks since the 2010s. South Korean and Japanese carriers have announced they will launch commercial 5G services in 2019. Major European operators target launching 5G in at least one city in each of the EU Member States by 2020. What Frequency Bands Will 5G Use? 5G networks are expected to run in the 28 GHz, 37 GHz, and 39 GHz bands in the U.S., according to the FCC. Generally speaking, 5G will start at 30 GHz so that it can take advantage of millimeter waves. For comparison, 4G works between 700 MHz and 2100 MHz. A gigahertz is literally a thousand times stronger than a megahertz. 5G is the first network to work on millimeter waves, which will allow for much higher data transfers than currently possible. Millimeter waves will also reduce the size of antennae needed. This means wearable technology like smartwatches or smart glasses will be able to fit 5G connectivity more easily. What Are the Differences Between 4G and 5G? Faster download and upload speeds. Better video calling, especially while moving. Better battery life on phones. Fantastic augmented reality, since 5G tracks users in real time and loads data faster. Virtual reality mobile experiences, due to speeds that can support real-time 4K streaming on mobiles. Improvements in wearable technology, like fitness bands that can track your every move. More IoT (Internet of Things) and smart devices The Internet of Things: How It'll Change Your Life Next Year The Internet of Things: How It'll Change Your Life Next Year Internet of Things has undergone its own Cambrian Explosion, and it promises to make your life much more convenient in the years to come. Here's why. Read More , since 5G antennae are smaller and more battery-efficient than current technology. Better driverless cars, since latency is dramatically reduced. There is a lot more to 5G, of course, including indirect benefits. For example, it brings long-term cost benefits to the mobile industry, which in turn, will pass on those benefits to the consumer. Carriers seem to be marketing their advanced LTE speeds as “5G” purely based on better download speeds. Are faster download speeds the most important thing for you? Do you think it’s okay for them to call it 5G based on that? Let us know your thoughts below! Explore more about: 4G, 5G. Frequency bands for example. There is no report on who currently uses these bands when it is actually outside broadcasts, live concerts, tv channels, radio reporters etc etc. What 5G does is take the frequency from all the major live events meaning that there is an impasse between companies like Shure, AKG etc. Essentially 5G has not yet taken off because it completely hamstrings all current users of the frequency bands. The roll-out of 5G is trying to ride roughshod over all current technologies just to give a slightly quicker facebook download time. I cannot understand this. 4G is absolutely fine, just increase the range and everyone will be happy. Blindly continuing with this frivolous pursuit of "newer/faster = more to charge to the consumer" should be stopped right now as it will not actually be practical. Just out of curiosity, how high of frequency bandwidth do live events need, and what type of live events, I heard people say 5ghz is fine for smaller maybe 10 or so i dont know for other ones. The really high ones should be used for more technical devices that will provide more functionality and speed, remember not just smarthphones. Plus programs and videos and files get bigger and so you need more speed for file transfer wirelessly for businesses or whatever, its not just facebook. Also the 5g networks will cause devices to use less energy when transferring, whos not for that? Plus am I right or wrong that new technology creates new ideas and ingenuity? A sad fact whether you like it or not is some ways get forgotten. Where would be if Alexander Graham Bell didn't use wire and said "oh who cares lets keep using cheap ink, wire is too hard to implement"! Point being, innovation causes creation for good and bad but is it going to be used for the greater good? I say we have a lot more people using cell phones, routers and telecommunication systems like government to control things remotely etc than to say hey this or that particular niche needs this so the greater good should suffer. And yeah it is about money, which drives competition, and spurs job growth and lowers prices and also makes new or expands current tech and ways of life. How we as humans apply those technologies is what makes the biggest difference! I don't think it will be true 5G unless all the requirements are met. I'll wait and see what all the hype is when 5G is officially available before leaving an opinion.